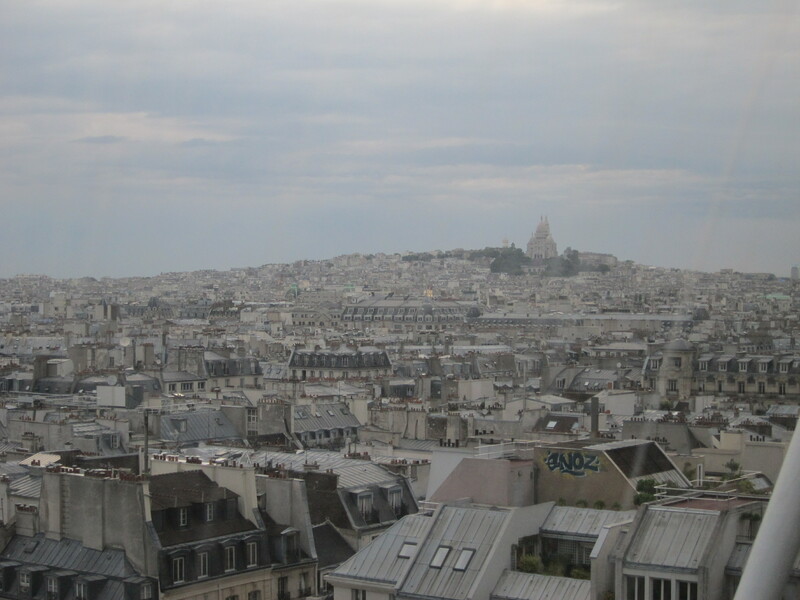 So I told you that we were planning to go to dinner at Georges, a restaurant at the top of the Centre Georges Pompidou. We did, and it totally rocked. Here’s how it went down. 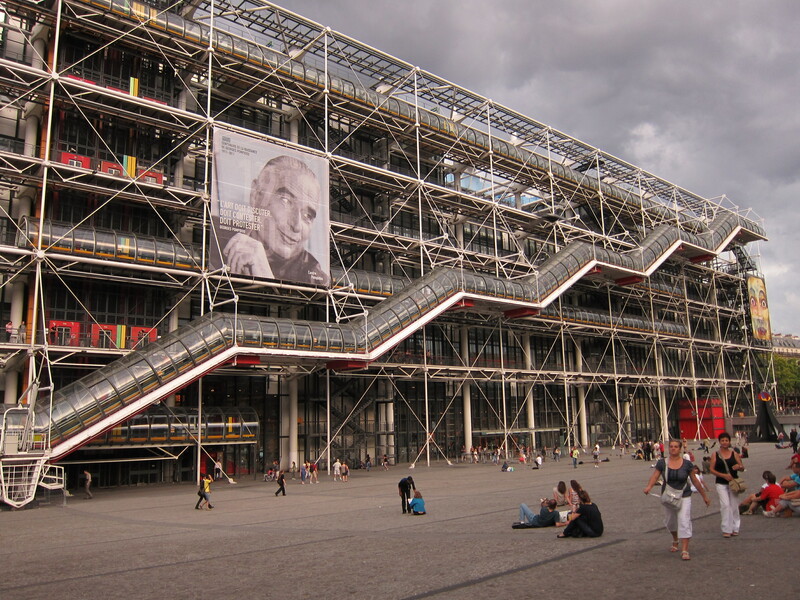 The Pompidou houses the National Art Museum, and is an extremely contemporary building. My girls thought it looked like a giant cruise ship, or perhaps a factory. 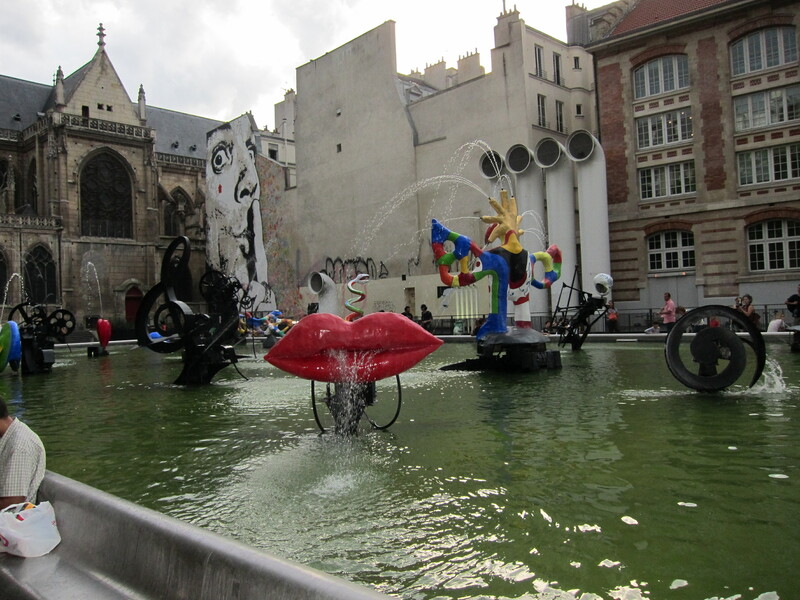 We loved the whimsical sculpture fountains outside the entrance to the Pompidou. A few days ago we would have been tempted to splash around in there with them. The real treat, however, was far above ground. 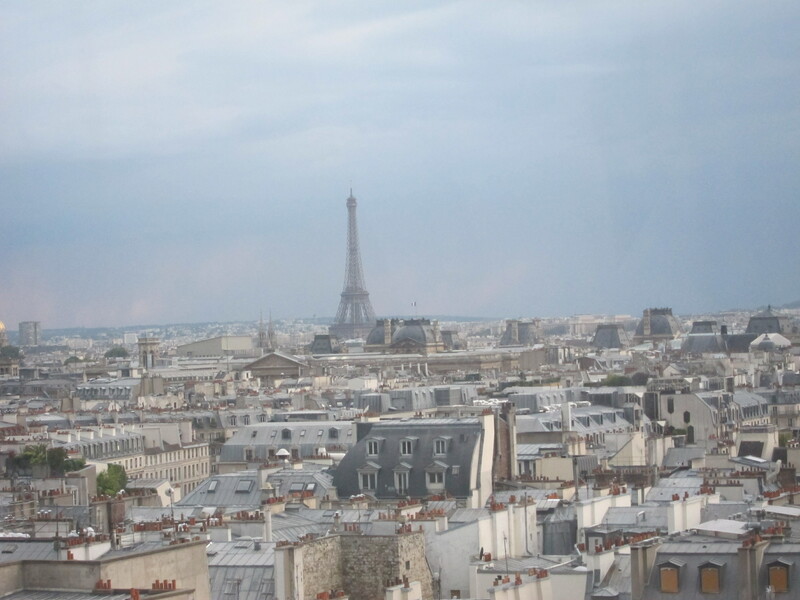 We took an elevator up to several escalators, which seemed to take us right up into Paris heaven. 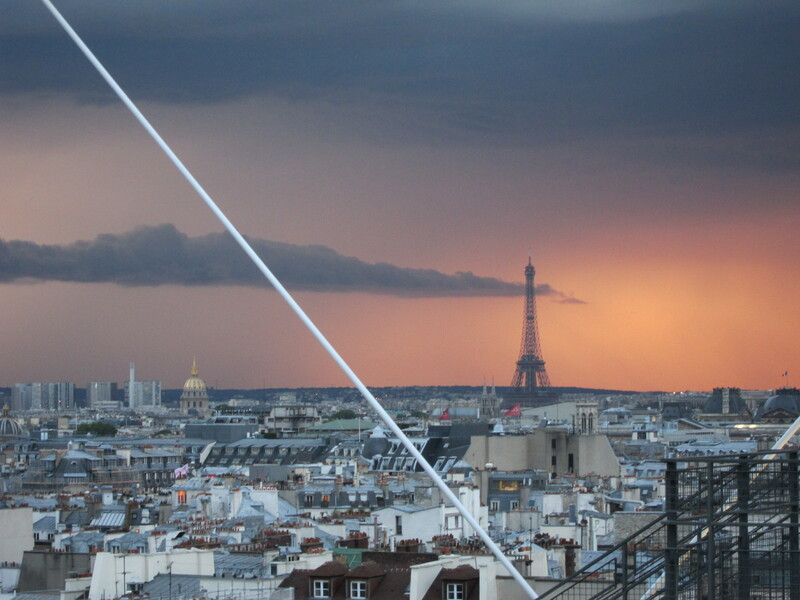 The view was fabulous, and changed dramatically as the evening went on. This was shot through the enclosed walkway leading to the restaurant. Farther to the right is Sacre Coeur, the church on the hill with its own great view. We declined to sit on the lovely terrace because the clouds were threatening rain, so our tall, leggy and lovely hostess led us inside to one of the many prime tables lining the glass walls. Wow. It took us awhile to take our eyes off the view and direct them to the menu. Yea! A menu we can read! We had a really hot nice waiter who spoke good English and was happy to make recommendations. The menu had lots of Asian fusion offerings, which were a welcome change. We sampled spring rolls, shrimp, and tomato mozzarella starters, and then devoured sea bass in a creamy sauce, chicken paillard, beef tenderloin, and a club sandwich. One of us is not very adventurous. 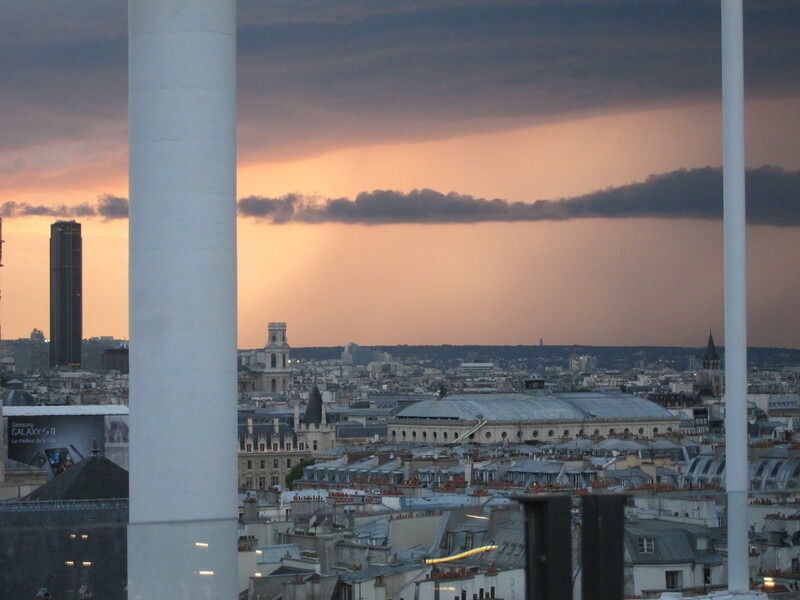 As we ate, the storm moved across the horizon, drawing me back onto the terrace for some more pictures. The inside of the dining room was also lovely and very modern. 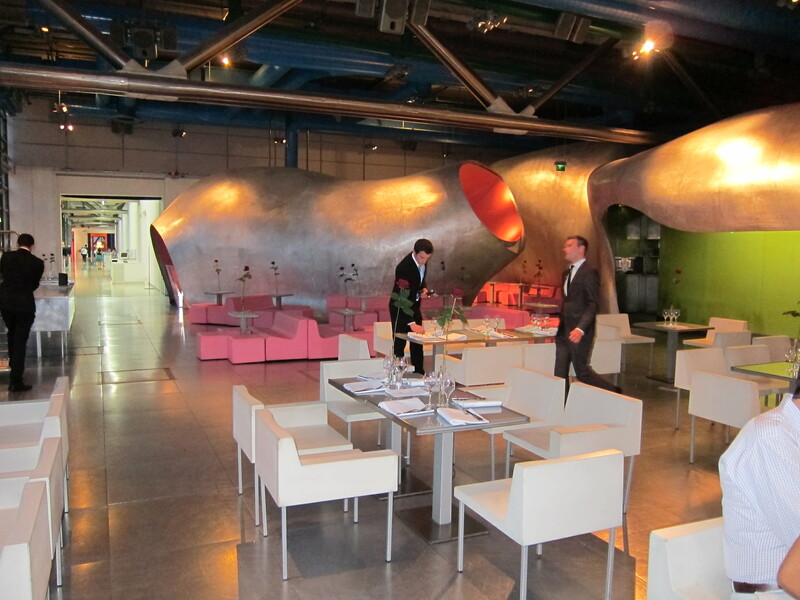 These large cavernous structures contained tables for those who preferred privacy to panorama. 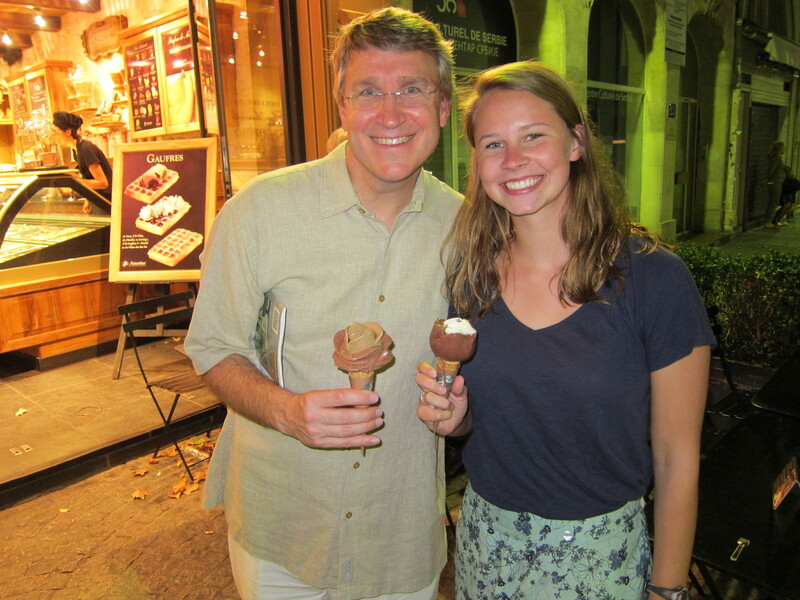 We finished it all off with gelato on the street below, which, in Paris fashion, was as beautiful as it was delicious. And so a perfect evening drew to a close. Lest you think I am only sharing the good stuff, stay tuned for the next night’s dining experience, which was smokin’ in a totally different way. 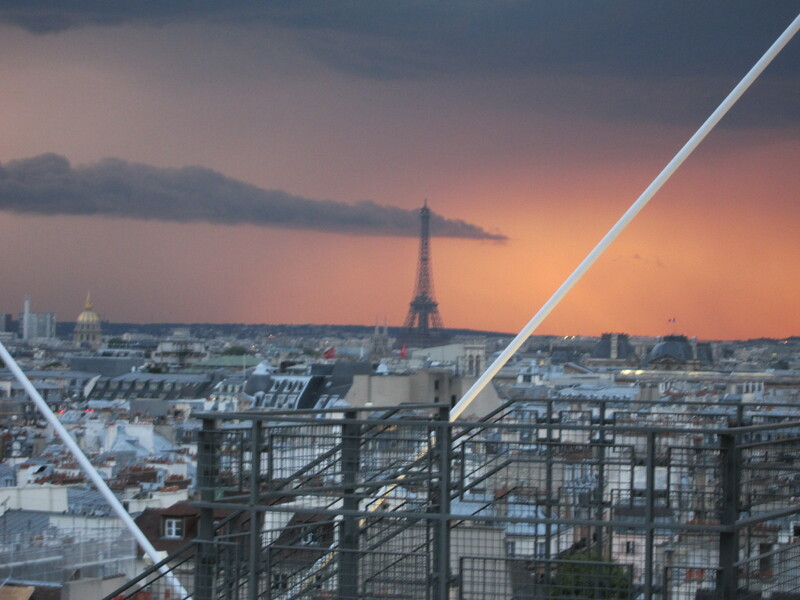 The views may be awesome, but all is not easy in Paris, my friends. “All is not easy in Paris” that’s an understatement! Hi, I am Catherine Lee, Mary Lipnicks sister. I loved reading your blog and signed up for the email. 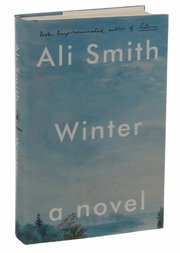 I am looking forward to reading more. I work at the Spec’s in Beaumont and love, love, love France! Hi Catherine! Welcome to my little blog world! 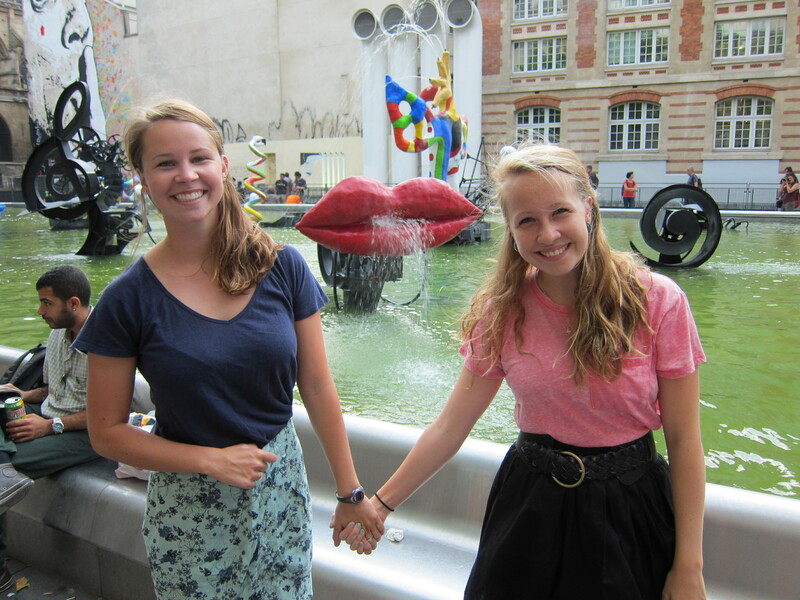 I love France, too, and I love your sister! Feel free to comment often- sometimes this feels like a one-way conversation with a rectangle. I am trying to will some of this cool air and moisture your way! Mark is adorable,as always, as are the girls. Say hi for me! Sorry, Tracie! You’re so right. That wouldn’t have embarrassed my daughters or anything, would it???? This is Cindy Lipnick’s aunt! Really thankful for your posts! 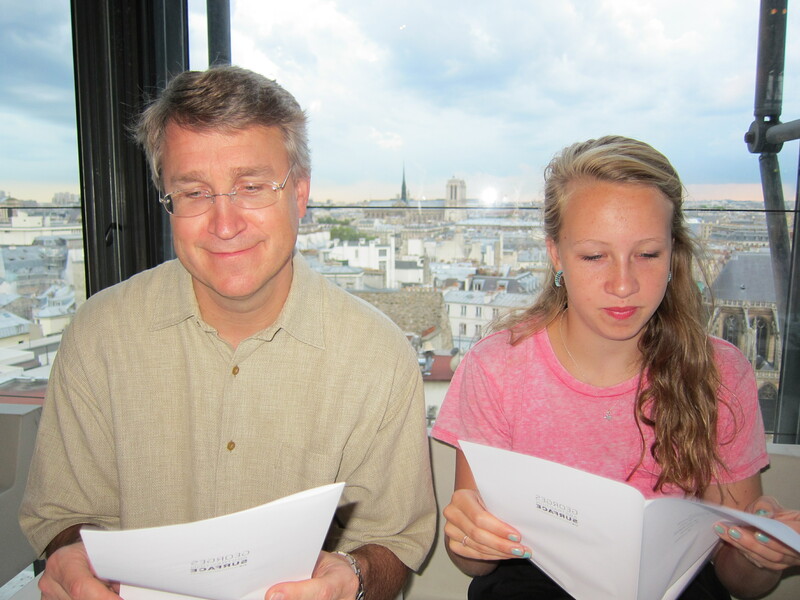 Our daughter Jeanie’s gift to her daughters when they turn 16 is a trip to Paris……..she will be there next March, again. I am sharing your posts with her and her daughters. Good luck and keep having fun! So intriguing…….so French—-WAITING for the next installment!!!!! !